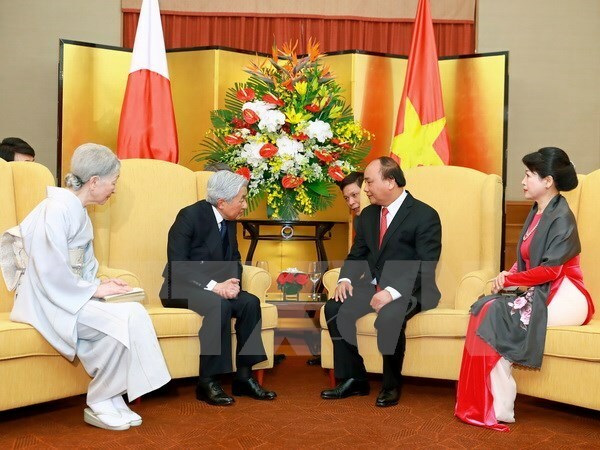 Prime Minister Nguyen Xuan Phuc met with Japanese Emperor Akihito and Empress Michiko in Hanoi on March 2, describing their visit to Vietnam as a significant and memorable landmark in bilateral ties. He expressed his delight at the vigorous, comprehensive and substantive development of the Vietnam-Japan friendship and cooperation, noting that the trip will help enhance their mutual understanding and cooperation in various spheres. He thanked the Japanese royalty’s attention to Vietnam and the two nations’ partnership and amity. He also acknowledged the Japanese Government’s effective assistance to Vietnam, particularly in the economy, noting that Japan is now a leading economic and trade partner of the Southeast Asian country. PM Phuc highly valued the role of and effective contribution by Japanese enterprises in Vietnam, adding that the Emperor and Empress’s visit will create a new momentum for business-to-business connections in the time ahead. For their part, the Emperor and Empress thanked the Vietnamese people for preserving Japan’s relics in Hoi An city and supporting the country to address the earthquake and tsunami consequences in 2011. At the meeting, the two sides highlighted historical links and cultural similarities between Vietnam and Japan such as wet rice cultivation, sericulture, and the love of peace, which are a foundation to intensify bilateral relations. PM Phuc invited members of Japan’s royal family to visit Vietnam on the occasion of the 45th founding anniversary of diplomatic ties in 2018. He also voiced his wish to meet the Emperor and Empress again during his visit to Japan in the near future.